(Newser) – Rihanna, Kim Kardashian, and others have gone to bat for a woman fighting a life sentence for killing a man when she was a teen, after she says she was forced into prostitution by her pimp boyfriend. 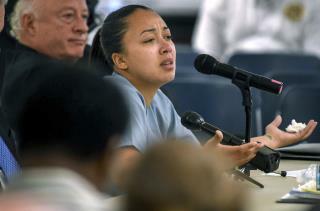 Now, per People, the Tennessee Supreme Court has ruled that Cyntoia Brown, 30, must serve at least 51 years before she can get parole; she'd be 69 when eligible. It was a unanimous decision Thursday, CNN notes, after the US Sixth Circuit Court of Appeals asked the state Supreme Court to weigh in, as state law was unclear. The ruling was in response to Brown's argument that the US Supreme Court ruled it unconstitutional to give juveniles mandatory life sentences without parole (a lower court noted her life sentence did include the possibility of parole), as well as that it's "cruel and unusual punishment." The appeals court rejected her first argument but is still reviewing the second. Why didn't she kill her pimp in self defense instead ?